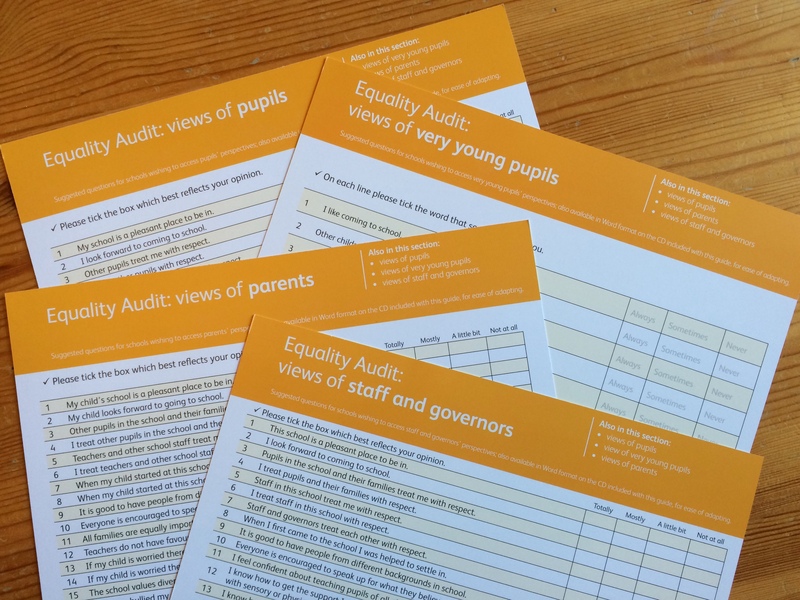 CSIE carries out equality surveys for primary and secondary schools that want a quick ‘snapshot of equality’, and offers support for schools wishing to carry out a more detailed equality audit. Our work engages the whole school community, is framed around our award-winning guide Equality: Making It Happen - A guide to help schools ensure everyone is safe, included and learning and can be tailor-made for each individual school. In this way CSIE enables schools to explore equality issues from multiple perspectives and helps them meet their legal duties under the Equality Act 2010. Straightforward, clear and affordable, this is an excellent way to get a ‘snapshot of equality’ in your school. We will set up four online questionnaires to gather the views of the whole school community: teaching and non-teaching staff, governors, pupils and their parents. The questionnaires will address a range of equality issues, including protected characteristics covered by the Equality Act 2010. We will give you a link to each questionnaire and ask you to invite every member of your school community to respond. We will then collect all responses and present you with the full results, with clear information on numbers and percentages, including graphs. In addition, we will give you a synopsis of the results, highlighting significant issues and making practical recommendations for the future. To order an equality survey, please submit this booking form. Thank you, we look forward to hearing from you! For schools that want a more thorough examination of everyday practices through the lens of equality, CSIE’s input can be decisive. By drawing from CSIE’s resources and experience, this process enables schools to gather rich information leading to a tailor-made action plan. We will visit your school at the start of the process to talk to pupils and key members of staff, get a feel of everyday life in school and ensure that any specific issues identified by the school are included in our joint work. We will then make a proposal on what information to collect, from whom and how. When this has been agreed, we will set up four questionnaires (online, on paper or a combination of the two, depending on what is right for your school) and invite responses from all members of the school community: teaching and non-teaching staff, governors, pupils and their parents. Schools that have opted for a paper survey will have the option of transferring the information online and submitting all responses electronically, to keep costs down. We will then collate all responses and present the outcomes in a detailed report, highlighting aspects of school life where diversity is understood and celebrated, clarifying areas where respect for diversity can be strengthened, comparing how different stakeholders have responded to particular questions, flagging up areas where people’s rights may be at risk of being breached, emphasising significant issues and making practical recommendations for the future. We will visit your school once more to discuss the survey findings with relevant staff and help put together a tailor-made action plan. We will negotiate all of the above with you and move forward in ways which best reflect your choices. To request a booking, please submit this booking form. Thank you, we look forward to hearing from you!